Sulfur has been found on Jupiter's moons Io and Europa. MER A Spirit has recently discovered several deposits on the Red Planet. How does electricity factor in? If we could stand on Mars unencumbered by spacesuits and take a deep breath what would we smell? Oddly enough, one thing that would be instantly noticeable is the odor of spent gunpowder or a burned match head. Mars contains rich deposits of sulfur. 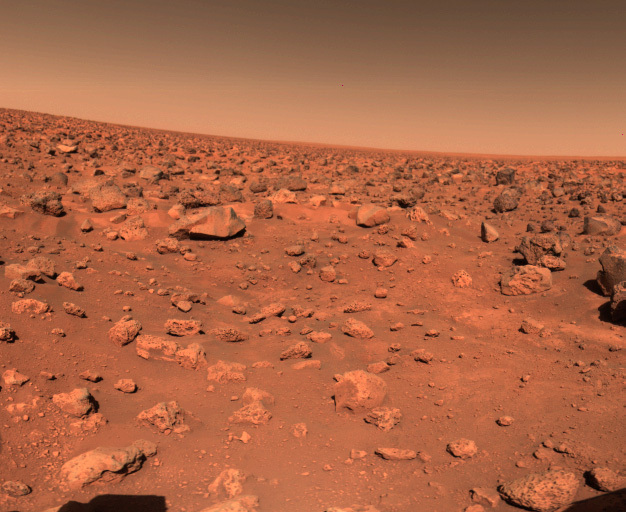 Sulfur was first detected on Mars in 1976 by the twin Viking landers. Chrsye Planitia and Utopia Planitia revealed a remarkable similarity between soil samples from the two sites, despite being more than 6000 kilometers apart. Vikings 1 and 2 detected sulfur compounds of up to 3% by weight in the fine dust. This led mission engineers to speculate that Mars has had several "homogenizing events," such as massive dust storms, that have mixed the soils into uniform beds. As the MER A Spirit traveled through an area of deep powder on the way to "McCool Hill" in 2006, its rear wheel became jammed, causing it to drag instead of spin. The locked wheel churned the ground, uncovering some particularly bright material just below the surface. A chemical analysis revealed the underlying soil to be high in magnesium sulfate, what we commonly call "Epsom salt," a white, crystalline compound. The majority of the sulfur on Mars is bound up with iron and magnesium into sulfates that seem to indicate a "long soak in water". 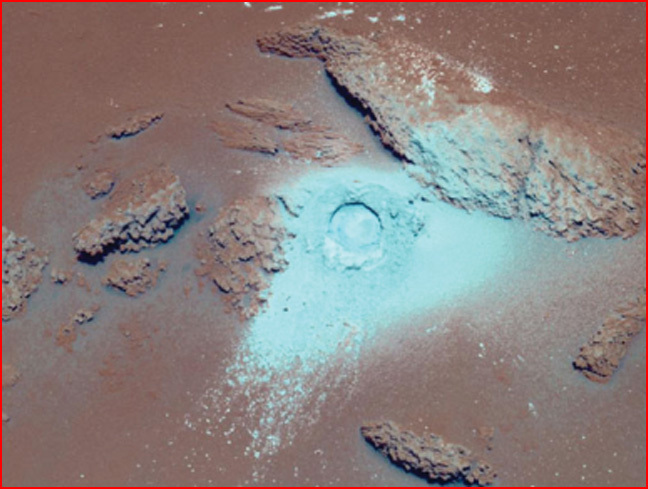 According to mission specialists, the magnesium sulfate accumulation indicates that the mineral either formed in the presence of water or remained submerged for a long time after formation. Since Mars was presumed to be a wet planet at some time in its past, the sulfates have provided theorists with potential confirmation. "These salts could have been concentrated by hydrothermal liquid or vapor moving through the local rocks," said rover science team member Dr. Albert Yen, a geochemist at JPL. "Mars The Wet Planet" is a theory that has become ever more popular because orbiting satellites and ground-based rovers have observed features that cannot be created from wind erosion - especially in light of new conclusions that the atmosphere on Mars is so thin that it would take a thousand years to move a "sand dune" a few meters, according to the October issue of Physical Review E.
On Mars, deep channels, mesas, ripples and other structures are thought to be the remains of water flowing on the surface, sculpting the terrain in the same way as water is believed to erode planet Earth. Since the theory proposes that there were oceans of water on Mars (although it was "millions of years ago"), the chemicals that form in the presence of water here are presumed to have formed on Mars by the same process. Despite the contradictory evidence of mineral deposits that would be destroyed by water, such as olivine, the flowing water hypothesis continues to guide theories of Martian geology. In previous Thunderbolts Picture of the Day articles, it was suggested that electric arcs could have played a major role in forming what we see on Mars today. A careful investigation into Valles Marineris, Olympus Mons, Argyre Planitia, Arabia Terra and both Martian poles has demonstrated strong support for the electric discharge theory. In other articles, we concluded that those same electric discharges on Mars could have transmuted silicon into iron and reformed silicon dioxide rock layers into the vast fields of hematite spherules that litter the landscape. Because electric arcs are capable of such transmutation effects, it has also been suggested that Jupiter's electrically active moon, Io, has experienced the transmutation of oxygen from water ice into sulfur, resulting in the gigantic sulfur "volcanoes" that mar its surface. In reality, according to EU theorists, the "volcanoes" on Io are the touchdown points where the plasmasphere of Jupiter completes its electrical circuit with the moon. The sulfur on Io and the sulfur on Mars could be from the same cause. Neither Io nor Mars have plasma sheaths, which would take up the stress of solar wind or Jovian electric currents far above their surfaces. Instead, the currents impinge directly. If they were stronger in the past, all the chemical compounds that have been attributed to water may have come about as the current flow pulverized the materials, compressed them in z-pinch zones, exposed them to intense shock and magnetic force fields, and then finally deposited them in layers following rapid cathode sputtering. A sulfurous smell is sometimes reported after thunderstorms have passed. 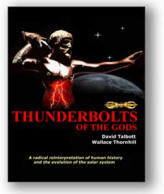 The lightning bolts are strong enough, apparently, to change some of the oxygen in the atmosphere into sulfur that burns to become sulfur dioxide, a strong-smelling compound. After an "electric dust devil" passes by on Mars that same stench could be present. If our theory of gigantic electric arcs large enough to carve Valles Marineris is correct, a great deal of sulfur may have also been created in that cataclysm and spread around the planet.